DeLand, FL has just been voted Central Florida's "Other Best Downtown" and is considered by some to be a hidden gem in Florida. What better way to visit and see all that DeLand has to offer than by staying in DeLand’s own hidden gem: Tropical Resort and Marina, a unique hotel located just minutes away from downtown. Come join the long list of guests that return to Tropical Resort and Marina time and time again as they travel down to enjoy nearby festivities such as Bike Week, NASCAR or DeLand’s own Fall Festival of the Arts, located on the bustling main street just minutes from our secluded natural environment. Choose from our one, two, or three bedroom apartment-style accommodations, or enjoy one of our fully-equipped studio apartments. All accommodations are available to rent on a daily, weekly, or monthly basis. What Sets Tropical Resort and Marina Apart From Other Hotels in DeLand, FL? Minutes away from downtown DeLand, home to gourmet cuisine, fantastic art and great shopping! 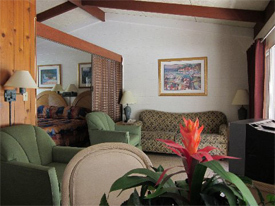 At Tropical Resort and Marina, we offer something for everyone. Perhaps you’re looking for the perfect spot to stay during your hiking and adventure vacation, or maybe you want a relaxed atmosphere that’s close to the action of Biketoberfest, Bike Week, Daytona 500, the manatees at Blue Springs, or other major events and attractions. We think you’ll agree that Tropical Resort and Marina is the best of both worlds – a quiet, relaxing hotel in a beautiful, natural atmosphere that’s just minutes away from all sorts of action and activities. And if you don’t believe us, check out the testimonials from some of the guests that have made Tropical Resort and Marina their home away from home, year after year. Contact us today to inquire about our fantastic hotel accommodations, venue rental, or fishing lodge. We’d love to let you in on the secret of all that Tropical Resort and Marina has to offer. Looking for a hotel in DeLand, Florida? Look no further.